The original Walther PPS pistol model was introduced to the market in 2007 and was/is called the Walther PPS M1 Classic. This version was successful, and ended up being a good seller in the Walther line. At the 2016 SHOT show, Walther debuted the 2nd generation version of the PPS called the Walther PPS M2. A button style magazine release – The M1 version used a European style paddle style magazine release that was integrated into the trigger guard. The M2 features a traditional button style magazine release which is much more common for US based shooters. The button magazine release on the M2 version is also reversible for LH shooters. A Fixed backstrap – The M1 version of the PPS used removable backstraps that also functioned as a safety device as the M1 version wouldn’t fire with the backstrap removed. The PPS M2 features a standard fixed grip (as in no removable backstraps) that is more ergonomic as compared to the M1 backstraps. Front Cocking Serrations – The M2 features front cocking serrations that were not available on the M1 version. Rounded trigger guard – While the M1 trigger guard had/is a more squared version, the new M2 features a more rounded trigger guard that is narrower than the one found on the M1. No picatinny rail – The original M1 had/has an integrated Walther picatinny rail, while the newer PPS M2 version does not. The PPS M1 and M2 are one of the few production 9mm models on the market that have a factory option for 3 different magazines with varying capacities. Note that the M1 magazines will not function in the newer PPS M2 version. 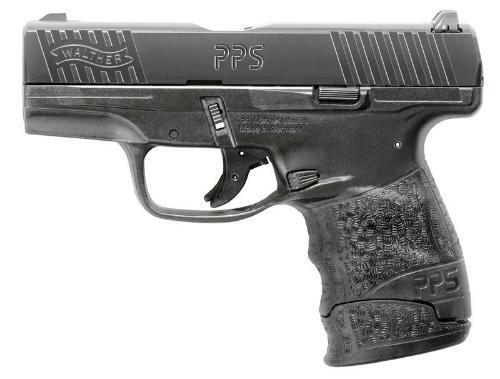 Standard PPS M2 – Comes with 3 dot sights and a 6 and 7 round magazine. PPS M2 LE – This is the LE variant of the M2, and it comes with 3 magazines (a 6 rounder, 7 rounder, and 8 rounder), and phosphorus 3 dot sights. These phosphorus sights will glow in the dark after being exposed to light, but lack the constant sight illumination found with tritium sights. PPS M2 laser – This variant of the M2 comes with 2 magazines (a 6 and 7 rounder) and a factory installed Crimson Trace laser (CT model LG-482 with a red laser. Crimson Trace is also offering a green laser version for the PPS M2 (CT model LG-482G). #1 – Will the PPS M2 fit in a holster made for the PPS M1 Classic version? Unfortunately, no it won’t as the dimensions on the M2 are different from the M1 Classic. The M2 fits into its own unique holster. #2 – I have one of the new PPS M2 models in .40 caliber, but I’m having real trouble finding a holster for the .40 caliber version. Do you have anything to fit the .40 version? The 9mm version of the PPS M2 and the .40 caliber version are basically the same size so your .40 caliber version will fit in a holster made for the 9mm version. Most holster makers who offer a Walther PPs M2 holster don’t even differentiate between the 9mm and .40 caliber version. #3 – I just picked up one of the newer PPS M2 models with the factory Crimson Trace laser installed, but I’m struggling to find a holster for it? Can you help? Yes, any holster you see listed below is available in a version to fit the Walther PPS M2 equipped with the Crimson Trace laser in red (LG-482) or green (LG-482G). You would need to choose either the LG-482 or LG-482G laser option under the lights and/or lasers drop-down menu on the page of the specific holster model you wanted to order. #4 – Do you offer a pocket holster for the Walther PPS M2? At this time, we don’t as the PPS M2 is really on the big side to be carried in the front pocket of most pants like jeans or khaki’s. #5 – Where can I see all the Walther PPS M2 holster models that you offer? All the holster models listed at the bottom of this page are made as Walther PPS M2 holster models (meaning any of these holsters are available in a version to fit the Walther PPS M2). #6 – Do you offer any pancake style belt holsters with a retention strap for the PPS M2? Yes. Any of the pancake style holsters you see below can be produced with an optional thumb break added to them for addition retention. #7 - I have one of the original Walther PPS M1 classic pistols. Do you carry any holsters to fit it? Yes, those holsters can be seen here: Walther PPS M1 Holsters. Any gun holster model listed below is available in a Walther PPS M2 holster version.